It’s not often that Archie’s enduring Sonic the Hedgehog comic series is the subject of Sonic fanbase ire. Yet the Archie vs. Penders saga and Penders’ subsequent work on the The Lara-Su Chronicles has proved a consistent source of puzzlement and frustration for all. The legal dispute itself isn’t something I personally find interesting — after all, industry wide creator-publisher disputes are hardly uncommon. I get the distinct feeling however that the road to The Lara-Su Chronicles‘ release will be the Sonic community dark comedy event of the year. And I’m enjoying every awkward minute of it. First, some back story. Boiled down to its very basics, Penders’ issue with Archie has always been one of character ownership. In 2009 Ken Penders began claiming copyright on original, albeit derivative, characters and stories he’d created while working on numerous issues of Sonic the Hedgehog and its spin-offs. 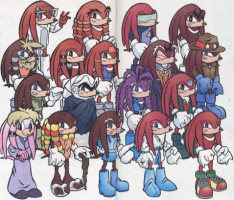 Of particular interest to this article are the “Lara-Su Chronicles” characters which were originally relatives of Knuckles or members of his echidna ethnicity. These characters were deeply embedded into the Archie-Sonic universe, were the main focus of the Knuckles spin-off comic series, and often featured in Sonic the Hedgehog and Sonic Universe. Numerous court cases ensued between Penders and Archie, culminating in a confidential settlement between both parties. The result? Penders came away with the unspecified rights to his characters and his stories with him also having unspecified control over Archie reprinting his original work. While it may prove divisive amongst TSSZ readers, I do actually support Penders’ decision to claim his work for his own. Penders wouldn’t have had a case to begin with if Archie had drawn up legally binding contracts that relinquished Penders’ right to the characters upon payment. It’s a common problem within the comics industry that writers and artists work on a freelance basis with no job or legal security whatsoever. Penders had been working for Archie without a contract for years – a huge oversight on Archie’s part that allowed Penders to very easily move in and file copyrights for his work. But instead of taking his characters and stories and riding off into the sunset, Penders did the unthinkable: he announced The Lara-Su Chronicles. My bewilderment at the announcement stemmed from the same argument that many other spectators were making: how can Penders create a new Lara-Su featuring comic book without infringing on Sega and Archie owned properties? The characters in question are all original personality-wise, but their visual design is clearly derivative of Knuckles’ and the stories they feature in are unequivocally tied to the Sonic-Archie universe. Penders’ answer to this conundrum is the complete redesign and rewriting of each and every character he intends to use – with unintentionally amusing consequences. Never in my life would I have expected any member of the Archie Sonic the Hedgehog team, past or present, to take what are, for lack of a better term, “Sonic Original Characters” and do what Ken Penders is doing to them. From the eerily humanoid redesigns, to the characters’ “radical”dress sense, to the ridiculous name change of“Echidna” to “Echyd’nya”; Penders’ supposedly tantalising reveals of The Lara-Su Chronicles are both increasingly embarrassing and hilarious. There’s also plenty to be said about The Lara-Su Chronicles scripts that Penders has been posting snippets of on his official forum. Take this preview, for example, which features awful teens-with-attitude characters standing around and talking for nine whole pages. Penders even has the audacity to name-drop The Floating Island and recycle the “Lara-Su succeeding her father” themes from the original Knuckles series. In this script preview Penders even mentions Mobius – Mobius for heavens sake! Oh, and Lara-Su’s father is already dead – how convenient. @TaylorHedgie I was the savior of the series. And you're welcome. Like the best of dark, British comedy, the tale of Ken Penders is humorous in its awkwardness yet has a worryingly serious undertone. Back in 2011 TSSZ reported on an affidavit written up by Penders for the Archie vs. Penders case. In it Penders openly admits that he was living off unemployment cheques, with less than $500 savings in his bank account. Between then and now Penders doesn’t seem to have worked on any projects other than his own, meaning that in all likelihood Ken Penders is still struggling financially. Despite Penders’ enthusiasm, there’s no guarantee that The Lara-Su Chronicles will ever see the light of day, let alone sell well enough to make the years of expensive legal battles worthwhile. But when all is said and done, Ken Penders will undoubtedly be remembered amongst Sonic fans for what he is: an eccentric, idiosyncratic comic book creator obsessed with legitimising his copyright claims and proving the strength of his derivative Sonic the Hedgehog characters. Let’s just hope it doesn’t ruin his life. Michael Westgarth is a freelance writer and podcaster. Read Michael’s previous columns via his TSSZ author page and head over to his personal blog to listen to his new podcast Chuckle-Bits Radio.